A CCTV Supervisor is an important job-role. He provides protection against threats and risks through surveillance and early warning. As threat and risks to modern living and businesses multiply, the requirement of CCTV surveillance systems and their operators is also increasing. Nowadays, most of the commercial and industrial deployments are equipped with such systems. 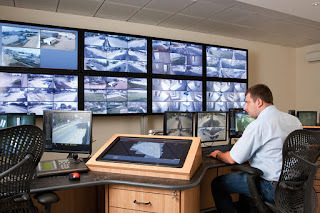 A CCTV Supervisor needs to know the basics of private security, supervision of security unit operations and spectrum of threats and risks to security and safety. He observes designated premises through CCTV systems; pick up early indications of problems pertaining to security and safety and respond appropriately by alerting various agencies. In case of any security threat, he must be ready to direct staff members to take appropriate measures to neutralize such threat. He should be well-versed with the private security operations and have basic technical aptitude. He must ensure that accurate records are kept and all actions are logged and data stored to enable reports to be generated for analysis by the Management team.